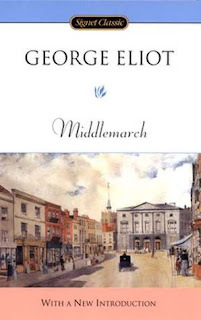 A Literary Odyssey: Book 146: Middlemarch by George Eliot (Finished-A Victorian Celebration). 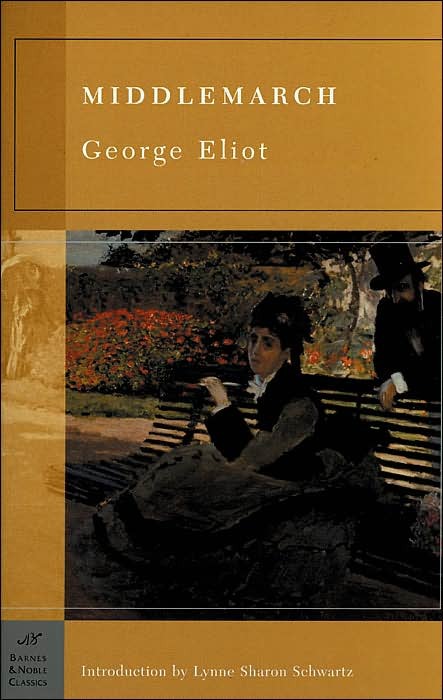 Book 146: Middlemarch by George Eliot (Finished-A Victorian Celebration). George Eliot is always such a treat for me to read. She was one of the first classics writers that I discovered on my own, and I have been happily reading and enjoying her books ever since my first read of Silas Marner. It has been a few years since I last picked up Middlemarch, so a lot of the details were very fuzzy (to be fair, it is a very LARGE book). As I began reading and starting plowing through Eliot's writing, bits and pieces fell back into place and I remembered who I liked and who annoyed me (Celia annoys me like no other. And I'm not sure why). In any case, it still took me a good chunk of time to get through all 900 pages of Victorian-era commentary (it took 2 1/2 weeks!). But when I set the book down, I realized that I enjoyed it more than I did during my first read quite a few years ago. One of the things I love about Eliot is that you notice pieces on rereads that you didn't notice the first time around. I had completely forgotten the plot with Fred Vincy, so when I stumbled across poor Fred and his adoration for Mary, it broke my heart a bit. I felt for Fred, who fumbled and who could never quite get his head on straight....unless it came to his feelings for Mary. I believe I paid far more attention to their chapters on this read than I had on the one before. I think Fred's story, and his struggle with finding a purpose within the confines of Victorian society probably rang true for many in the time period. I am sure that many a young man was unruly and unsure of a path to take. Fred, for example, was clearly not a man that should have headed into the church. As he told Mary, he could do the job, but he wouldn't have passion for it. He needed some kind of work to inspire him and make him a better person. I can relate to that so well! Part of the reason I love teaching is that it challenges and inspires me to try new things, to push myself. I saw a lot of myself in Fred and his struggle. And, of course, I was happy with the way his story ended. I also had to chuckle quite a bit at Mr. Brooke, who never intends to be funny, but always seems to bring out a smile. His insistence on stepping in when things get a little bit tough is endearing, especially when he reverses what he sets out to do and muddles things up even more than they already were! "But it is very difficult to be learned; it seems as if people were worn out on the way to great thoughts, and can never enjoy them because they are too tired." When I read that, I had to agree with her, because yes, focusing and exploring areas to become learned is a tiring process. 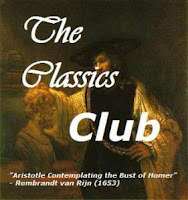 That piece definitely resonated with me as I continue on in my own exploration of literature and the classics. Sometimes I feel like I am rushing through to get to the next title. That I must push onward and forward in an attempt to get to it all. And I am slowly losing the bits of enjoyment from savoring passages that I love, raving about writing, and loving the characters. So thanks, Dorothea, for reminding me. What I love, however, is that Eliot gives Dorothea a chance to live her life with the early passing of Casaubon. And while Casaubon is a bit of a jerk in his will (you'll have to read it to find out! ), Dorothea finally has the means to pursue her own passions as a free woman. The last two parts or so, where she is finally free, were inspiring. I love a Victorian woman with a sense of purpose. I love that she went against the wishes of her male relatives. She was firey and passionate and everything that I love! For a book that is, at it's core, a true study of the way relationships and marriage worked in this society, it was inspirational and heart-warming. In each of the couples, I found something that I understood and related to as a married woman in the 21st century. In a way, it kind of amazes me that the same issues they faced we still face today. I think this bit from the "finale" says it better than I can..
"Marriage, which has been the bourne of so many narratives, is still a great beginning, as it was to Adam and Eve, who kept their honeymoon in Eden, but had their first little one among the thorns and thistles of the wilderness. It is still the beginning of the home epic-the gradual conquest or irremediable loss of that complete union which makes the advancing years a climax, and age the harvest of sweet memories in common." 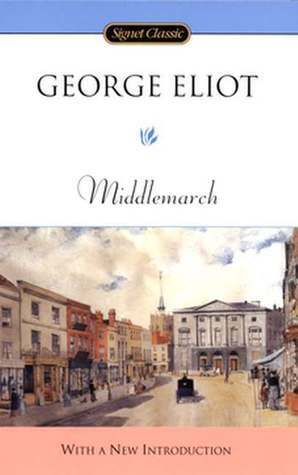 Yes, Eliot is a master, and Middlemarch is definitely a great work. But can I be honest? As much as I loved Middlemarch, it's characters, and the messages it portrays, my heart yearned a little bit for The Mill on the Floss. 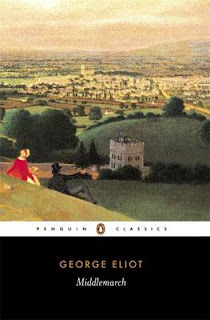 And while I can see why so many love Middlemarch and see it as Eliot's crowning achievement, I'm happy with saying that I think that title goes to Mill. While they both hold a lot of passion and strength, there is something much more powerful in The Mill on the Floss. 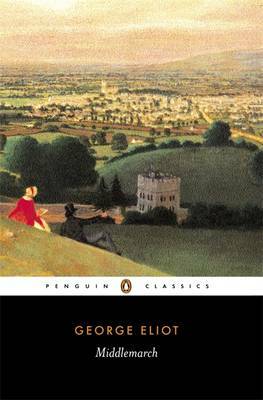 But you should still read this one-to savor the language and the various ways that Eliot explores the many facets of Victorian life. There is so much more to this 900 page chunker than I could hope to write about here! I just read Silas Marner for a second time in my life. I'd forgotten most of the book! Loved it this time through, just a wonderful endearing story. Hoping to start The Mill on the Floss soon, I don't think I'll read Middlemarch this year but maybe someday. I enjoyed reading your honest review, nothing wrong with comparing an authors books and stating which one you loved the most. What do you think of Nicholas Nickleby? 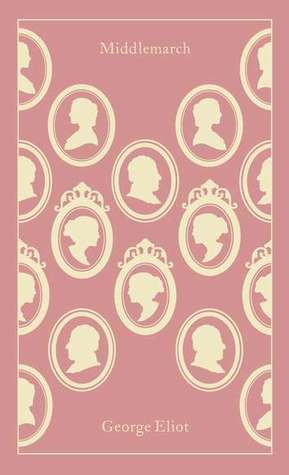 I'm yet to try Middlemarch, for some reason I've always thought of her books as daunting. But you don't make this book sound daunting at all in your review, you make it sound interesting and fun, so it sounds like I'll have to change my preconception! I've never read Eliot but I do own "Middlemarch" and this post has piqued my interest. I love the quote you included and will now add this book to my tbr list. Thanks! You really, really make me want to read The Mill on the Floss. :) I've read Book One of Middlemarch so far and love it! I'm in no hurry to read this and will probably keep it until next year. I have a feeling I will feel the same as you and for now I can't imagine anything being better than Mill on the Floss. 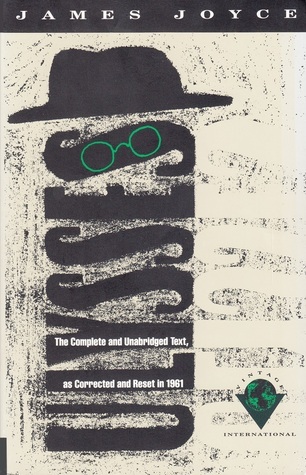 I remember absolutely adoring this book when I read it in college. I've been meaning to re-read it ever since, but damned if the length doesn't have me running for the hills. "a book that is, at it's core, a true study of the way relationships and marriage worked in this society" Yes, that is how I read it. For that reason, I loved it! That is the subject that will capture my appreciation and love no matter who wrote about it: Gaskell, the Brontes, Jane Austen, or Eliot. Although I will say Middlemarch is one of my favorite books EVER. I agree with you, I like Middlemarch a lot, but I love Mill on the Floss probably just because Maggie is such a great character. I didn't realize till I read your review how much I liked Fred and Mary's romance. It was rooted in realism on both their parts. I think it made for a good contrast between Dorothea's and Rosamund's illusions and their hasty marriages. It's strange, but I found Fred and Mary a bit tiresome. For me it was Lydgate that made 'Middlemarch' possibly one of the best books I have ever read. Mind you, it did take me at least six hundred pages to start appreciating the book at all!